Located atop the hills surrounding St-Christophe des Bardes to the northeast of St-Emilion, Laroque is the largest estate in the appellation. The vineyards were first laid out in the 18th century by the Marquis de Rochefort-Lavie, and the estate remained in the same hands until 1935 when, the wine production having ceased due to the Great Depression, it was bought by the current owners, the Beaumartin family. From the early 1960s the vineyard was replanted and expanded, from 40ha (hectares) in 1962 to 61ha today, all on contiguous plots: rare even for small estates, and unique in St-Emilion. From the whole estate, on a plateau of clay-limestone with shallow soil, only the best 27ha are used for Laroque, the remainder being sold as Château Peymouton or the estate’s second wine Les Tours de Laroque. Since 1982, winemaking has been in the hands of Bruno Sainson, the much-respected director of the property, who retired last year. 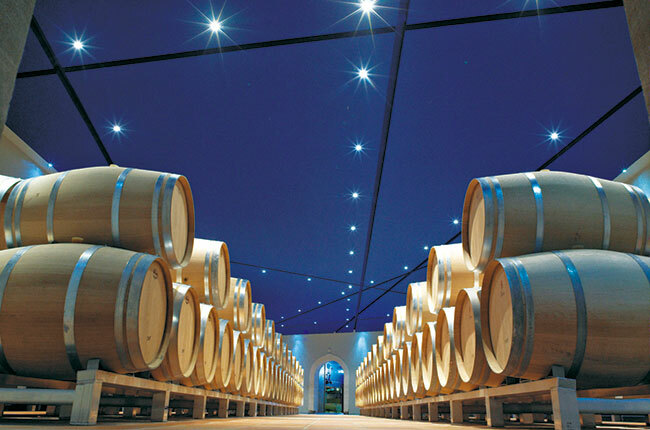 Space is not an issue at Laroque and the vast fermentation cellar contains sufficient temperature-controlled cement and stainless steel vats for plots to be vinified separately. Generally the vatting period for the Merlot is 25 days and 23 days for the two Cabernets. Laroque is aged in 50% new oak, while for Peymouton the figure is just 15%. Until the 1996 re-classification of St-Emilion, the whole vineyard was St-Emilion grand cru, the submission of the 27ha of Laroque being accepted for elevation to grand cru classé. Although well-known due to its history and size, the name remained in the middle ranks of the appellation until recently, following the arrival in 2004 of Xavier Beaumartin and his wife to take personal charge and revitalise the previously uninhabited château.